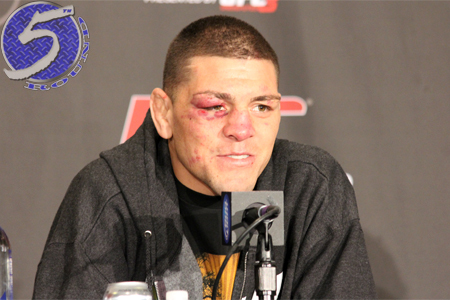 For those of you who can’t decide whether Nick Diaz (Pictured) or Carlos Condit will leave UFC 143 with welterweight gold, you’re not the only ones. The Gambling Gods have scored the top contenders dead even heading into their February 4th shootout. Diaz and Condit are both pegged at -115. Although their 170-pound scrap is a pick ’em, the sportsbooks still need to pocket some guaranteed money and have tacked on 15 percent juice. The chances of Condit having UFC president Dana White wrap the belt around his waist increased drastically after champion Georges St-Pierre was forced out of their bout with a knee injury. “The Natural Born Killer” was initially a whopping 3-to-1 underdog against GSP. The Mandalay Bay Events Center in Las Vegas, Nevada hosts UFC 143. The interim welterweight title fight headlines the pay-per-view broadcast.